As a third generation Italian-American, cannoli have always been the ending highlight to every Thanksgiving, Christmas, graduation, wedding, anniversary, or any other celebrated holiday or family get-together. Cannoli are Sicilian pastry desserts that were historically prepared during Carnevale season. Cannoli consist of tube-shaped shells of fried pastry dough, filled with a sweet, creamy filling usually containing ricotta cheese (and in less traditional, but more modern American versions, marscapone). They range in size from “cannulicchi,” no bigger than a finger, to the fist-sized proportions typically found just south of Palermo, Sicily. Like many families, recipes had been passed down from generation to generation to my Nona through watchful eyes and practice… not written down, and surely not following any conventional measuring system. My mom worried herself as she had not had the chance to learn how to make cannoli from her mother and my Nona. 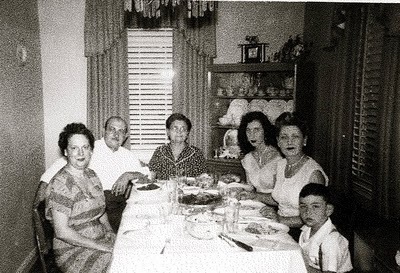 My Nona and her mother (right) in the early 1950s during one of many family dinners. It was then much to our surprise that two weeks later we stumbled upon an old wooden recipe box. In between recipes clipped from magazines, tattered and faded from 20 plus years of life, we found a yellowed 3×5 index card with the scribblings of my Nona’s (and Big Nona’s) cannoli filling. Like many versions with which Americans are most familiar, Nona’s recipe tends to involve variations on the original concept (my only explanation for the vanilla pudding). This is possibly due to adaptations made by Italians who moved to the United States in the 1900s and discovered limited availability of certain ingredients, especially later during the Great Depression, like my Big Nona and Nona. Note: Cannoli shells can be found at any local Italian grocery or bakery. Hey, if it was good enough for my Nona, it’s good enough for me! Line a baking sheet with several layers of paper towels, and spread ricotta cheese, covering with saran wrap. Refrigerate for one day to allow excess moisture to escape ricotta cheese. Change paper towels once, gently rolling ricotta cheese to new paper towels. Once excess moisture has been removed from ricotta cheese, mix all ingredients in a large bowl until smooth. Refrigerate until used to fill cannoli shells. Do not fill cannoli shells until ready to serve, or pastry dough will become soggy. Sprinkle with confectioner’s sugar on top.